In its simplest form, Six Sigma quality performance means no more than 3.4 defects per million opportunities. Imagine the confidence you would invoke in your customers if they knew that for every 1,000,000 products or services, only 3.4 would have quality issues. Now that's certainly peace of mind for your customers! What Can Six Sigma Do for a Company? Six Sigma targets reducing variation and waste, giving your organization a competitive advantage and improved bottom line. It can be used in any industry including manufacturing, service, healthcare, education, distribution and government. 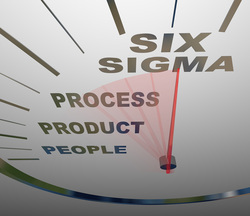 Six Sigma aligns responsibility for achieving company objectives throughout the organization. From top management to the certified Six Sigma Black Belts, who manage products that help achieve the company objectives, down through the Six Sigma Green Belts, who help support the objectives through smaller, simpler, tactical projects. Combine the tools of Lean to reduce waste and the tools of Six Sigma to reduce defects and variation and you are introduced to the synergistic methodology of Lean Six Sigma (LSS). Lean Six Sigma utilizes the familiar DMAIC phases of Six Sigma, but arms the user with tools from both the Lean and Six Sigma arsenals. The tools for eliminating waste that we get from Lean and the focus on defect and variation reduction we get from Six Sigma has created the most powerful continuous improvement methodology available today. As a result, Lean Six Sigma managers can effectively address issues of speed, quality, and cost. Lean Six Sigma methodology has been proven effective not only in the private sector, but has also shown to be very effective at eliminating waste from other organizations across the United States Federal Government including the Department of the Army, Naval Air Systems Command, General Services Administration, Central Intelligence Agency and Department of Treasury. Lean Six Sigma is being used in local state governments as well as cross industry sectors including service, distribution, manufacturing, health, education, and food.